The free use of secure bike storage with individual locks, drinking water and washing facilities at the hotel only a few mins walk away was particularly useful. The swimming facilities were also very good and flexibility around showering after check-out was highly appreciated. Everything was perfect, beautiful room, nice helpful staff, near to the beach, great breakfast. It was the quiet season and we were upgraded to Villamaria. Great sports facilities. Everything was fabulous. Very clean, very helpful friendly staff. Facilities were excellent. we were cycling & the facilities for the bikes were fab. It's an excellent place to stay. All the staff are very helpful, pleasant and cheerful. Lock in a great price for Hoposa Montelin – rated 8.7 by recent guests! Hoposa Montelin This rating is a reflection of how the property compares to the industry standard when it comes to price, facilities and services available. It's based on a self-evaluation by the property. Use this rating to help choose your stay! One of our best sellers in Port de Pollensa! 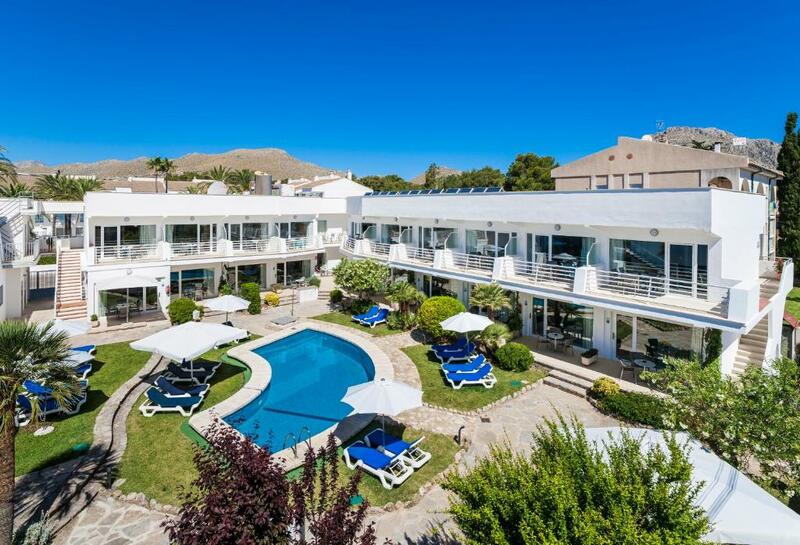 Located in one of the most beautiful areas of Majorca, 650 feet from beautiful beaches in Port de Pollença, this modern apartment complex is perfect for a relaxing break in the sunshine. Spend the day relaxing by the swimming pool in Apartamentos Montelín, and soak up the beautiful Majorcan sunshine. Take a dip in the pool to cool off, or grab a refreshing drink and unwind while reading a book or the newspaper. Guests have access to the facilities at Apartamentos Villa Concha, which include swimming pools and a bar. There is also a games room with arcade games. Montelín provides spacious and comfortable apartments equipped with kitchens, so you can prepare your own meals with family or friends. They also come with a terrace or balcony, where you can enjoy sunbathing in privacy. All modern studios offer views of the pool. On-site facilities for cyclists are available, and include a bike garage and tools for repairing and washing bikes. 뀐 Located in the top-rated area in Port de Pollensa, this property has an excellent location score of 9.0! When would you like to stay at Hoposa Montelin? This air-conditioned studio features satellite TV, a private balcony or terrace and a kitchenette. House Rules Hoposa Montelin takes special requests – add in the next step! Hoposa Montelin accepts these cards and reserves the right to temporarily hold an amount prior to arrival. Please note that check-in takes place at Apartamentos Villa Concha, opposite the apartments. Please note that guests are not allowed to store their bicycle in the room. The bicycle storage service must be used. Apart from the training pool. The pools where too cold for the children to be able to swim. The only gripe was that we had two singles instead of a double bed (but the beds were at least very comfy). Too much single use plastic for butter etc. Pool was cold but it was October! Comfy beds and spacious bathroom. It would have better for the sink to be in the shower room rather than in the living area. The shower room could have been made bigger as there was plenty of room.